Ever since last spring I have been dreaming about shepherds' pie. Although my mother made it one or two times that I can remember in my childhood, it holds no special nostalgic importance to me. I didn't order it in any of the pubs we visited in England (although I did sample quite a few beef pasties - yum!). I can't for the life of me think what put it into my head, but once it was there it would not go away. I found it on the menu at retro-nostalgic Silver Cloud last April when Lynda and I met there for dinner, and since that was about the time I had started to think about it, I ordered it. It was all right (although Lynda's meatloaf in Bell's Amber Ale Gravy was much much better), but it was a little too deconstructed to satisfy my craving. 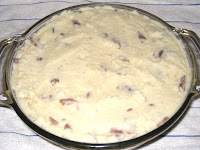 Instead of being spread over the meat mixture and browned, the garlic mashed potatoes were just scooped on top, and the meat mixture was a touch overseasoned. So all that really accomplished was to make me want the real thing even more. But alas, summer was coming, and it got too hot to even consider cooking something so heavy, let alone eating it. So I decided to wait. Almost every week, though, I would think about it, wondering if there were any chance it was cool enough. Of course it never was, even if we did have a milder-than-usual summer this year. I knew the time would come, though, so I waited. And then finally, a couple of weeks ago, the temperature did drop enough that the thought of having the stove on for a couple of hours seemed like a good thing, and I had the potatoes, ground beef, and carrots already at hand. I got to work and came up with a meal that satisfied my craving. At least for a while. 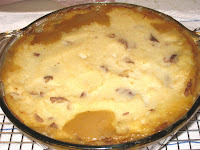 A true British shepherds' pie uses lamb; apparently if you use beef then you should call it a cottage pie. 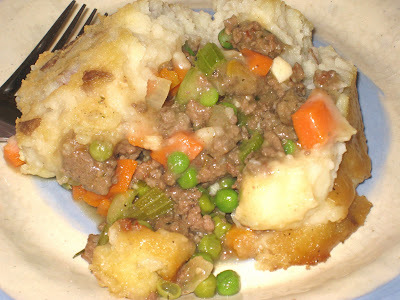 I used beef, but here in the states you can use beef or lamb interchangeably and still call it shepherds' pie. The one thing I would do differently next time is that I would make the mashed potato layer thinner. I had a lot of potatoes mashed up, so I used as much as I could, going all the way up to the top of the pan. I did leave the skins on and I would do that again next time (they're yukon golds so the skins aren't that thick), but the potatoes were so thick they did not brown properly. It tasted good, but they didn't crust over like they should have. Some recipes call for cheese on top but I left that off. It seemed rich enough without it, to me. Heat oil over medium-high heat in skillet. Add beef and brown for 5-10 minutes. Add onion and garlic and cook until translucent, about 5 more minutes. 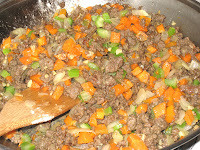 Add carrots and celery and cook until softened, about 10 more minutes. Add 2 tablespoons of flour and make sure to mix it in well. Let cook for at least two more minutes to cook out the flour taste. Add the broth, thyme, marjoram, salt and pepper. 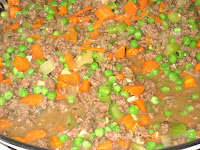 Bring to a boil, lower heat and simmer 20-25 minutes, until thickened. Pre-heat oven to 350 deg. F. Pour the meat mixture into a greased baking dish. 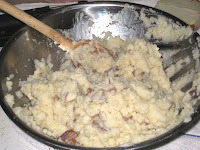 Cover the mixture with potatoes, bringing mashed potatoes all the way to the edges of the dish so that the meat mixture is entirely covered. Bake in oven for 30-35 minutes, until the potatoes are browned. Let sit for fifteen minutes, then serve.